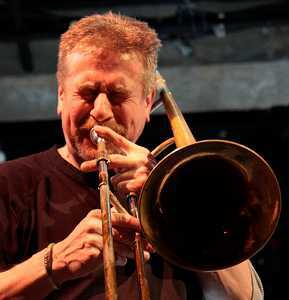 Steve Swell has been an active member of the NYC music community since 1975. He has toured and recorded with many artists from mainstreamers such as Lionel Hampton and Buddy Rich to so called outsiders as Anthony Braxton, Bill Dixon, Cecil Taylor and William Parker. With over 40 CDs as a leader or co-leader, Steve is a featured artist on more than 100 other releases. He runs workshops around the world and is a teaching artist in the NYC public school system focusing on special needs children. Steve was nominated for Trombonist of the Year in 2008 & 2011 by the Jazz Journalists Association, selected Trombonist of the Year 2008 - 2010, 2012 and 2014 by the magazine El Intruso of Argentina, received the 2008 Jubilation Foundation Fellowship Award and selected by the Downbeat Critics Poll in the Trombone category from 2010 - 2014. Steve is a teaching artist through the American Composers Orchestra, Healing Arts Initiative, Mind-Builders Creative Arts Center, and the Jazz Foundation of America.